Song of India, India Temple is a very fine fragrance from R-Expo that matches and blends into human sense of scents. The aroma is unique and like no other, we carry the full line of India Temple: incense, oils, candles, and bath products. R-Expo is donating a portion of these sales to benefit the needy children of India. Fine out what "smells just like temples in India" is all about. 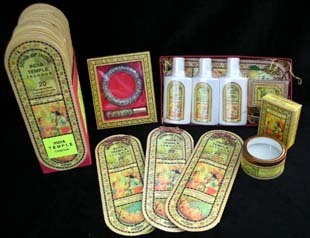 We also carry Song of India personal care products in Patchouli, Sandal, Lavender and Nag Champa. Click here to see more from the Song of India line.